This summer, we were introduced to Sagrantino, an amazing new wine, from Raffaldini Vineyards and Winery. This wine is typically found in the province of Umbria, located in Italy just east of Tuscany, not at a North Carolina winery. Raffaldini specializes in Italian varietals and this is a wonderful addition to their line of wines that include Vermentino, Sangiovese, and Montepulciano. Sagrantino grapes produce a dry, bold, deep rich red wine with flavors of black cherries and spice with earthy characteristics. Our introduction was a pleasant one. We look forward to having more of this wonderful wine. If you love big red wines, give this one a try if you get the chance. You will be glad you did. 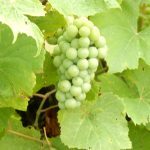 The Norton grape, also called Cynthiana, is one of the most widely grown grapes in Kentucky. One of the reasons for its popularity is its heartiness; Norton is able to withstand temperatures as low as 20 degrees. The grape, a hybrid of a vitis labrusca and a vitis vinifera, was developed by Dr. Daniel Norborne Norton, at his vineyard in Virginia. The oldest “American” grape, it was available as a varietal in 1830. Norton was quickly recognized as the American grape that could produce a wine to compare with big European red wines. The Wild Vine: A Forgotten Grape and the Untold Story of American Wine, written by Todd Kliman, is a good read for those interested in the Norton grape. In mid-summer, the Norton grape gives no hint of the deeply dark wine that is to come. Like with most grapes, the grapes begin green and later develop their color. By harvest time, the grapes have ripened to the lush colors we lovers of the grape and the wine have come to expect. The deep, dark, almost inky color of the grapes give Norton wines that that deep garnet color. A number of Kentucky wineries produce Norton wines, some as their selected reserves. For lovers of the big, bold red wines, this one is a favorite with its aromas of spice, and flavors of cloves, nutmeg, and cinnamon. Whether you discover a Norton or a Cynthiana, give it a try. The wines the grape produces are memorable. Bella Misto is a dry red wine that we discovered last summer on our trip to Raffaldini Vineyards in North Carolina. The wine is amazing. Bella Misto is roughly translated from Italian as beautiful mix. The wine lives up to the name. A blend of eight grapes, the first three are Montepulciano, Sangiovese, and Petit Verdot. A dense color and smooth texture gives this wine deep satisfying dark fruit flavors with a lingering aftertaste. Bella Misto has become a favorite. January weather has been dreadful, but a bottle of Bella Misto, a lovely warm fire, and that special someone made it much more bearable. Hope you have managed to find a way to stay warm. Let’s hope for an early spring. Verdelho is a white wine grapes most often associated the island of Madeira, or Portugal and Spain. 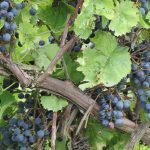 The grapevines were introduced in Australia in the early 1800s, and much more recently in the United States. Chateau Thomas Winery, in Indiana, makes this wine from hand-harvested grapes, shipped in a refrigerated truck from a vineyard in Lodi, California. Verdelho has aromas of honeysuckle, peaches, and limestone. The wine has mineral flavors with spicy, nutty, overtones, with a lingering finish. While no one would describe Verdelho as a light white wine, the full-body flavors add a dimension to the enjoyment of this wine. Though this wine is not as familiar to white wine lovers as a Chardonnay or a Sauvignon Blanc and is harder to find, I recommend giving it a try if you get a chance. Readers will know that Barboursville Vineyards remains my favorite winery and generally I choose one of their wines to celebrate special occasions. We recently celebrated a birthday and opened a bottle of Octagon that we were saving for a special day. This was the 2005 vintage. Octagon is the premier red blend created by Luca Pascina, the winemaker at Barboursville. Vintages of Octagon have been served to Queen Elizabeth and at events in Washington, D. C. Wine competitions and wine ratings have consistently given this wine the recognition it deserves. The 2005 vintage was a blend of Merlot, Cabernet Sauvignon, and Cabernet Franc. The complexity of this wine allowed for each of the specific flavors to be tasted, but it was the blend that was noticeable on the finish. The wine was definitely worth waiting for and my only regret is that it is no longer available at the winery. “3 Reds by Wight” is a blend of 50% Petite Syrah, 20 % Cabernet Sauvignon, and 30 % Cabernet Franc and is 100% Kentucky Proud. Jim Wight has proved, with this exquisite red wine, that Kentucky can grow quality varietals and produce quality wine. The wine is a dry red with aromas of berries and spices. While the wine will benefit from aging, today it is a lovely dry meritage styled wine. There is a dry, tannic structure with flavors that remind one of an old fashioned blackberry jam cake. The first taste is one of berries and dark fruit, while the finish has blackberry and spice flavors. We saved our first bottle for a Valentine’s celebration and it made for a memorable evening. We toasted the day with crystal wine glasses engraved with “3 Reds by Wight”. Now we look forward to the next special occasion. Wine lovers have probably heard about and tried a medium-bodied, red Pinot Noir. Many wine drinkers enjoy the cherry-berry like flavors and aromas. The Vin Gris de Pinot Noir is a white wine made from the Pinot Noir grape. Winemakers achieve this style of wine by running off the juice and removing it from contact with the skins. The wine is then generally aged in stainless steel rather than oak barrels. While in Virginia, we bought a bottle of Vin Gris de Pinot Noir made by Gabriele Rausse Winery. Rausse is an Italian winemaker whose wines reflect his European heritage. His vineyard and winery. located in Albemarle County near Monticello, is not open to the public for tastings, but it is definitely worth it to seek it out at wine shops in Charlottesville. We tried it this week and I have to say that I wish I’d bought more. The wine was excellent with floral and apple aromas, the color of a pink pearl, with a crisp finish. All of Rausse’s wines are exceptional and maybe I loved it because of the winemaker, but I am now more open to try other Vin Gris de Pinot Noirs. Several other wineries are making this wine as well. If you find one, you might want to give it a try. I think this wine would appeal to all white wine lovers and many red wine lovers, because of the versatility of the flavor.